The Samsung I9300 Galaxy S III starts off with the basics - quad-band GSM/GPRS/EDGE and quad-band 3G (AWS is missing though). An LTE-variant of the device is also available for supported regions. Samsung's latest Android flagship raises the bid with Bluetooth 4.0 with High Speed. Its transfer rate isn't yet official but is expected to top 21Mbps. Wi-Fi Direct is a similar technology, which offers blazing fast speed. The Wi-Fi support includes a/b/g/n versions, with both 2.4GHz and 5GHz band compatibility. 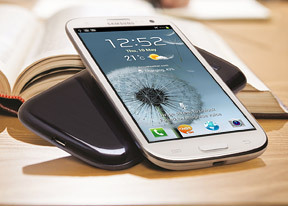 The Galaxy S III allows you to share all sorts of media via NFC by simply touching the devices back-to-back. Sadly, you'd need two Samsung I9300 units to make this work as there are no other S Beam-enabled smartphones on the market just yet. You can share with other NFC devices as well, but functionality is limited to what is provided by the stock Android Beam. We tested this with the Galaxy Nexus and we had no trouble transferring webpages and contacts from our S III to the Galaxy Nexus. While the interface of the Android web browser hardly has changed, the Samsung Galaxy S III has the hardware specs to propel it to great heights of user experience. The pretty large, sharp display with great colors makes reading a joy. The powerful quad-core CPU and Mali-400MP GPU enable the stock Galaxy S III browser to play 1080p Flash video without a hitch. That was truly impressive stuff considering a lot of netbooks would choke on something like that. You can play touch-optimized Flash without breaking a sweat too. Brightness and colors option gives you four different presets to adjust the display according to your preferences. Automatic brightness is an option, too, and works only within the browser. Hubs are not just for Windows Phone 7 - Samsung, at least, seems to think so. They've added a total of 4 Hubs to their new Android superphone. The Social hub we've seen before - it combines your email accounts with social networking (Facebook, Twitter, MySpace, LinkedIn) and IM accounts (Gtalk, MSN and Yahoo! Messenger) and shows all incoming messages as one list with handy shortcuts to reply, mark as favorite and so on. There's filtering by message source too, to help manage the inflow of incoming updates. The Music Hub lets you browse music online (with search tools, charts, lists of new releases and so on). You can preview songs (30 seconds each) and buy tracks or whole albums. The Readers Hub has been replaced with Google's Play Books store. You can subscribe to Internet newspapers, magazines or buy e-books. You can download free book previews. Extensive genre listings will help you discover new titles. Finally, there's the Game Hub, which will quickly become your go to place for finding new games. The titles break down into Social and Premium games and there's a news section too. There's a try-before-you-buy option, so you can check out a game before committing your cash. The nice thing about that Hub is it includes the titles by Gameloft and EA, which are otherwise not available on the Google Play Store. The Samsung I9300 Galaxy S III comes with the Polaris Office preinstalled, which gets more and more love from hardware manufacturers by the hour. And for good reason, we guess - it's one of the most feature rich mobile editors we've seen. You can view and edit Word, Excel and PowerPoint documents and there's a PDF viewer to boot. Editing on the large 4.8-inch HD Super AMOLED display is a breeze and covers an almost full set of options - text style, justification, paragraph formatting, bullets, even creating tables (that's a first). If you're editing an Excel file, you get a formula wizard, resize rows/columns, border style, merge cells and so on. Even full-featured PowerPoint presentations are doable. The app doubles as a file manager and also integrates with Google Docs and Box.net.